Muck Boots Woody Max is an awesome boot. I have been deer hunting thirty two years and if there is one thing I have learned over the years the quickest way to have a miserable hunt is to get cold and having cold feet is the worst. That is why when I was contacted to do a product review for The Original MUCK BOOT COMPANY I was pumped. I know several people who swear by Muck boots but I had never tried a pair. I told The Original MUCK BOOT COMPANY I would love to try out a pair and give a review on them here on Deerhuntingbigbucks.com. They quickly sent me a pair of Muck Boots Woody Max cold weather hunting boots to try out and review. I opened the box and right away I liked the Mossy Oak Break-Up® Camo and the overall look of the boot was great. I tried them on and man I have to say they were very comfortable but I had to get out in the field and give them a true test. Deer season is quickly coming to an end here in Kansas and I hadn’t had a chance to get back out hunting until after the holidays but the first chance I got I headed out. We had a winter storm roll in and what better time to try out my new cold-conditions hunting boots. As I was getting ready for my morning hunt it was nice that I could slip these boots on and off easily but once I slipped them on with my thick wool socks they are very stable and fit like a glove not to tight not to loose just right. 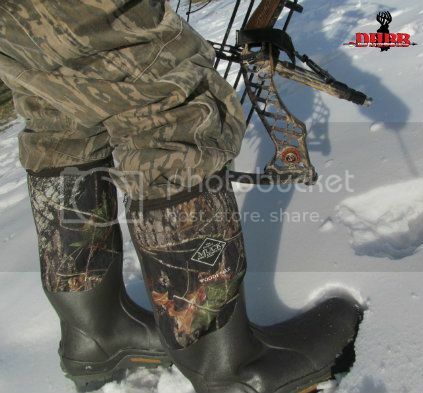 Muck Boots Woody Max are very comfortable, warm, dry and very dependable cold weather hunting boots. There was about four inches of snow on the ground and the temperatures were a balmy 10 degrees with about 20 mile an hour winds as I headed to the stand before daybreak, I hunted for 3 hours and my feet stayed warm and dry and even though my hands and face got cold having warm feet helped me to stay in the stand longer. I was also very impressed with the boots comfort when walking to the stand and the traction in the snow and ice was excellent. Scent control is very important to deer hunters and I love the fact that Muck Boots have rubber bottoms and I don’t have to worry about leaving my scent where I walk. I am very impressed with my new Woody Max cold weather hunting boots by The Original MUCK BOOT COMPANY, I just wish I had tried them much sooner. Nothing beats a great pair of boots and I plan on using Muck Boots for years to come. We live on a farm and I plan on getting a pair for my wife and two boys to wear around the farm. I definitely recommend Muck Boots, all you hunters should get you a pair you will be glad you did. I would like to thank The Original MUCK BOOT COMPANY for the chance to review a great pair of boots, I am hooked! If you have questions or comments for us here at DHBB feel free to fill out our contact form.